First impression: Unique concept. Can't wait to read it! I absolutely loved Jay Asher's Thirteen Reasons Why, and although I haven't had the pleasure of reading Carolyn Mackler's previous work, I have heard fantastic things about her writing, and was thrilled to hear that the two were pairing up for this novel. What a blast this book was! First of all, the 90's references. It brought me back to those simpler times when I used to curl up with my YM Magazine while listening to Boyz to Men. Those references gave me a special connection to the book. Although I wasn't the same age as Emma was in 1996(I was 9) I could relate to her on a stronger level than I have with other female characters. The unique concept of this book was what initially grabbed my attention. In a time where the world is so reliant on Social Media, this book definitely makes you wonder what things would be like without it. And if we had the ability to see our 'Future statuses' would we like what we see in those few short sentences? Emma and Josh did what most people would have done. Act first, think later. Emma's (at times) foolish actions caused some major repercussions for her future. There were times where I just wanted to grab her and scream "STOP IT!". Asher and Mackler did a fantastic job with creating these simple yet bold characters. Jay Asher's and Carolyn Mackler's writing style blended together perfectly. They each gave the novel a personal touch. 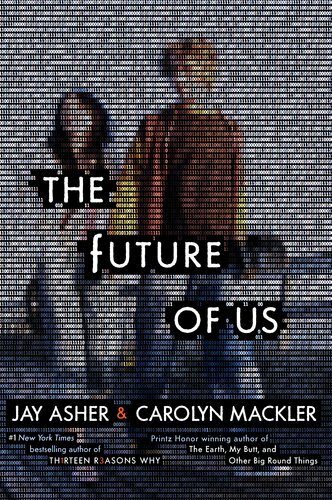 The Future of Us was a book that I was anxiously anticipating and was thrilled to finally start reading. The end result was I didn't want it to end. I couldn't put it down and I loved the characters. This book made it's way to my top reads of 2011. A must read! Last impression: In case the review doesn't say it clearly. Read it...Now! Oh, I'm glad you liked this one- I've been seeing some mixed reviews of this. The concept is so awesome, I'm hoping that I love it, too. I have an arc i got awhile back that i need to read!!!! here's my review of the alchemy of forever, releasing in january. stop by?!? !